The continued success of this event, including free parking (thanks to First Niagara and Independent Health) depends on everyone being respectful of the surrounding neighborhood and other cars in the parking lots. We encourage you to not park on residential streets, please park in our many free surface lots plus our ramp. For the early hour attenders, the first lot to head to is our events lot off Hydraulic Street between Seneca and Exchange Street. You are welcome to bring a folding chair to the event.No coolers, no outside alcohol, other beverages or food may be brought into Larkin Square.Alcohol may not be consumed in our parking lots or on the streets.There is no smoking in Larkin Square, including e-cigarettes.Restrooms are located behind the Filling Station and in the plaza area behind the Boardwalk. There are also restrooms in the Hydraulic Hearth, and at Flying Bison. The Hydraulic Hearth Restaurant & Brewery (across the street from Larkin Square) invites you to bring Food Truck purchased food into their restaurant to enjoy. They have a wide selection of beverages, including an on premises Community Beer Works Satellite Brewery. Flying Bison Brewery open and hosting a few food Trucks on Tuesday nights as well. For a complete list of Food Trucks, weekly bands and market vendors, click here. Due to the large number of food trucks interested in participating in the event, there will be some rotation of trucks in Larkin Square on any given week. 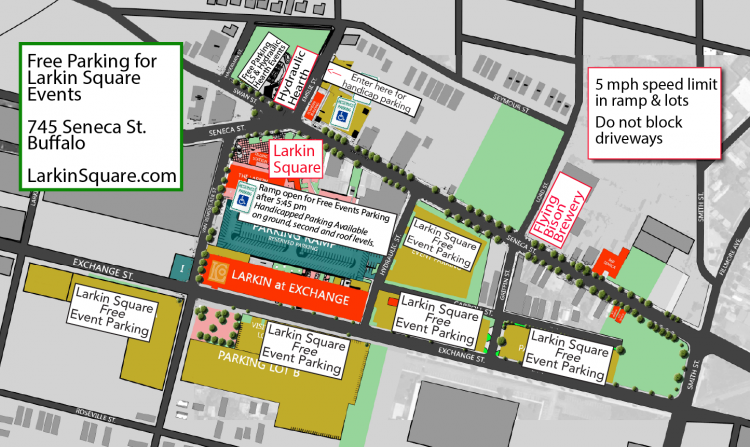 For your convenience, a parking map is posted here. Please share a link to this post with any of your Food Truck Tuesday friends and family! See you in the Square!